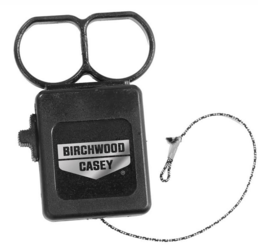 The new Birchwood Casey® Bore Weevil™ eliminates the hassle of dealing with dirty pull-through bore cleaners and bent or broken rods. The Bore Weevil is a fully retractable pull-through cleaning system that reduces contact with cleaning chemicals and allows cleaning without firearm disassembly. It comes with three Quick Attach Couplers that will accept any 8/32 thread cleaning brush, jag, mop or looped patch puller on the market. To operate the Bore Weevil, open the action of your firearm, making sure it is unloaded, then drop the tether through from the muzzle end and lock the length in place. Next, hook the Quick Attach Coupler with the brush, mop or jag attached to the tether and pull it through the bore. With a minimum amount of passes, shooters can have a clean bore in no time. The compact size of the Bore Weevil makes it easy to carry in any shooting bag or pocket, so you always have a way to clean your firearm’s bore in the field. The Bore Weevil sells for a retail price of $43.30. 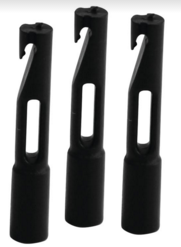 A replacement 3-pack quick coupler set sells for $11.70.